Nasi Padang , is one of comfort food for me and I think everybody like it. You can easily find Padang restaurant in Jakarta, yes so many ! Believe me they're all good, but not all of them still using the authentic recipe for the dish because it's quite hard to find West Sumatran's local ingredients, and now let me introduce you the recommended authentic Padang restaurant called Marco Padang Grill. 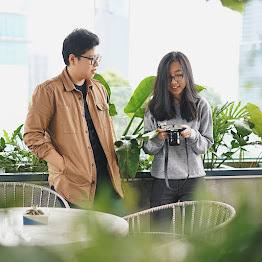 They're not new, they've already had 2 branches in Setiabudi One Building and Lotte Shopping Avenue, well the Lotte Shopping Avenue is their newest. And why Marco Padang Grill is different with another Padang restaurant? First, the Chef Marco Lim was born and grow in West Sumatran where he's really expert at history and recipe of Padang cuisine, so he brings the authentication to Marco Padang Grill and satisfaction to every customers. Well, you won't believe they're Indonesian restaurant from the interior, they look like somekind french restaurant, so classic and beautiful. Feel so warm to be here and the ambiance was really friendly, I do love being here and you can see the cooking process here and not like another Padang restaurant where the food already prepared, here they made by order, so it will fresh from the kitchen ! So be patient for the food, it's not an ordinary Padang restaurant :p well, let's go to the food !! Enjoy a traditional healthy meal with Marco's Padang Vegetable Salad ! Well, I've just known that Padang also had their own gado-gado :9 This Padangnese Vegetable Salad contains sliced of white cabbage, green curry lettuce, cucumber, boiled potatoes, fried tofu, noodles and cucumber, tossed in peanut sauce and served with emping (melinjo crackers) and red crackers (authentic padang crackers). Delicious ! Broth based soup Padang style with herbs, spices, dry-fried sliced beef, rice noodles, perkedel (potato cakes), fried onion & celery served with rice crackers and ground curly red chili on the side ! A delectable bowl to warm up your day :9 tasty ! This traditional recipe is hard to find in today's Padang restaurants. Here at Marco Padang Grill , they serve it as good as the locals used to make in the old days. Thinly-sliced and deep-fried bitter beans dish (pete), tossed in finely ground curly red chili pesto !! It's a must try for the uniqueness eye-glasses shape and crispy texture, and more importantly, without the strong undesirable smell, they're tasty and guilt-free ! Once named as the best dish in the world, Randang is undoubtedly an all-time favorite in Padang cuisine repertoire. At Marco Padang Grill , their famous Randang Itam is made of high quality ingredients ! Beef shank stewed in coconut milk and cirik minyak (condensed burnt coconut oil) *this is why they called randang itam* mixed with herbs and curly red chili. With both skill and patience, Chef Marco cooks the meat meticulously for more than none hours to make it tender, succulent and rich in flavors. That's what we called a labor of love, PERFECT ! Grilled Barramundi Fish marinated in coconut milk with finely ground curly red chili, sliced of turmeric leaf, lemongrass, tamarind, lime leaf and lime juice, ONE OF THE BEST GRILLED FISH IN MY LIFE !! They're grilled in pacak way, well Pacak is a cooking technique that involves cooking meat with it's own juices or sauce or marinade, prominently used in grilling or roasting. Originally, pacak also mean "tapping gently". The locals use lemongrass sticks dipped in marinade to rub the Barramundi and let it grilled. Seriously a must try dish ! Beside Barramundi they also has Pari :9 they're all superb ! Charcoal grilled beef tenderloin marinated in coconut water with shallots, garlic, and coconut oil. Served with Lado Pop (a mixture of coconut cream and finely ground curly red chili that usually used in Ayam Pop) and Lado Kecap ( a mixture of sweet soya sauce with slice of chili padi, curly red chili, shallot and lime juice ! in Minang language Batokok means "pounded on or flattened out" Enjoy this traditional recipe from Kerinci region and they'll dance in your mouth ! Fresh squeezed orange juice mixed with fresh coconut water with simple syrup and topped with shredded coconut. FRESH ! A really great companion for Padang dish here !! You must try Marco Padang Grill's Iced Coffee !!! Double shots of Bukitinggi Robusta served in wine glass, so classy. Perfect drink to cool yourself down on a hot day ! If you're not into black coffee, it's a perfect choice ! Your iced coffee will be completed with sweet condensed milk ! also served in expensive-look wine glass. Last but not least ! Yeah Es Durian !! Durian or widely known as the king of fruits is very popular in the Sumatera region. Try Marco Padang Grill's famous dessert featured the rich and silky fresh of durians. Nothing can go wrong with good quality durians served with assorted traditional jellies (Cendol, Agar-Agar, Kolang-Kaling, Cincau Hitam) and drizzled with white and chocolate condensed milk and simple syrup on top ! Whether you have a sweet-tooth or not, this refreshing dessert is irresistible !! Well, that's it !! I think it's enough, I'm full now ! HAHA I really appreciate them as they bring Padang Cuisine to a next level and can we compare with another western cuisine :9 I love everything about Marco Padang Grill it feels like they have nothing bad hmmm great ambiance, delicious food, affordable price and I just can't say anymore beside this is one of my favorite restaurant !